Aish. I’m seriously over both Ji Hui and Aran. Yes, I understand a bit where Aran is coming from as it does seem very unfair for Ji Seok to get the lion’s share when there are two grandchildren, but at the same time, isn’t it more normal for a male to inherit versus splitting a company? Patriarchy is not a thing of the past and male heirs are still preferred. We all know that Mrs. Gong isn’t going to force mother and daughter out onto the streets as penniless beggars. That being said, Mrs. Gong is wrong in doing this for Ji Seok in a pathetic attempt to make what she did okay. It’s not okay and she hurt and destroyed her own family because of it. Even if this does tie into helping her daughter-in-law and son build L Foods, it’s a whole lot of wrong and her asking Seon Yu to grin and bear it is also very wrong. We all know that it’s pretty hard for any truth to stay buried, it always comes to light in some way and will only wound people more. There’s little comfort in the “for your own good” speech. I’m curious if Dal Nyeo will remember the past and Mrs. Gong and use that for leverage, but I do believe Ji Seok will learn the whole truth soon, so I don’t see how that will exactly work. And what happens when Ji Seok’s real mother comes back? So many questions. Less than 20 episodes left. Ok. Mrs. Gong is reeling from the truth and she isn’t stupid. She knows Seon Yu had Tae Jeong kicked out because of Jin Yu and the baby. While she digests this info, Seon Yu and Ji Seok are turned away. Seon Yu wonders if Tae Jeong caused this bad mood with Mrs. Gong and Ji Seok says Tae Jeong was escorted off premises before he could see Mrs. Gong, but you can’t rule out a phone call. Ji Seok wonders why Seon Yu thinks it has anything to do with Tae Jeong and Seon Yu says it’s just because Tae Jeong waited all night outside the house. Right. The two have a cute little moment before Ji Seok walks off and Ji Hui brings herself into the equation. I hate every scene with her in it now even if Tae Jeong is getting his comeuppance. She basically tells Seon Yu straight up that her days are numbered and Seon Yu asks for time to tell the truth to Ji Seok and leave on her own accord. Ji Hui then gets viciously angry. What happened to loving Ji Seok forever? Oh, Seon Yu will love him forever. She just won’t be able to be by his side as she constantly tries to remove herself from the equation. We know how she operates by now. Ji Hui’s actions and attitude is really a testament to how far she’s fallen. Seon Yu has went through equally bad and traumatizing things and lost just as much and even while she’s out for revenge, she does her best to minimize collateral damage and only hurt her real targets. Ji Hui is locked and loaded and doesn’t care who gets hurt. I think it just further proves how she’s always had a dark, twisted side that Tae Jeong and the ensuing events brought to the surface. Seon Yu also has no problem shouldering responsibility, some of which isn’t hers alone, and knows she must pay for the wrongs she’s done to others that she loves. Sure, she does like to tell Tae Jeong it’s all really because of him and Jin Yu’s death, which it is, but she also knows that the ends doesn’t wholly justify the means. This is something that Tae Jeong, Aran, Ji Hui, Dal Nyeo, and Mrs. Gong really don’t understand, although Mrs. Gong isn’t quite as bad, but she’s still bad. Dal Nyeo can’t bear to sign the shop away and decides to beard the lion in it’s den. It’s too unfair for Tae Jeong and herself to suffer alone. Tae Mi tries to steel herself and work hard thinking that possibly hard work can save them from losing the shop if they can manage to improve the revenue. she sets out a booth for free samples and sits listless and cries. Gi Jin sees her and his heart does cry out for her. He knows she’s a good girl even if her family is rotten to the core. He goes for a free drink and she is very happy to see him. She then makes his drink extra special as it is their way of finally parting. She then says to think of her whenever he thinks of that coffee every now and then. She then reveals that he will probably hate her more because of what her mother is about to do to Seon Yu. Hahaha! Good girl! She’s warning Gi Jin so he can warn Seon Yu! Gi Jin calls up his cousin who was visiting Pung Ho who was worried over what happened with Tae Jeong and was telling Seon Yu he can lean on her whenever she needs help. Seon Yu rushes to cut Dal Nyeo off and the two have a yelling match in the middle of the street where Dal Nyeo is trying to place all blame on Seon Yu who isn’t innocent. Funny how all these people don’t realize that Seon Yu isn’t really as bad as they seem to think. I’m sure you can guess the contents of the argument and the mutual threats, so I won’t elaborate. It’s been done to death really. Anywho, Mrs. Gong sees this and stops the car. She goes to send Dal Nyeo away and take Seon Yu home with her when Dal Nyeo starts running her mouth. Mrs. Gong cooly returns hit for hit. Since she knows the whole truth now, there is now way that she will forgive and forget. 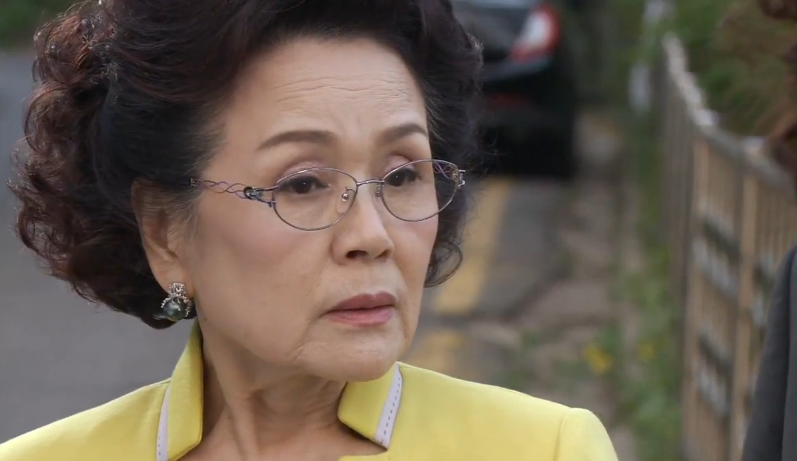 Dal Nyeo is astounded to hear Mrs. Gong address Jin Yu’s accident and the fact that Jin Yu’s child is also Tae Jeong’s. Poor Seon Yu is horrified and saddened that Mrs. Gong had to learn this from an outside source instead of herself. So? Are you here to admit your son killed her sister? The two go back to the Seo household (or maybe it was a restaurant or something somewhere else) where Mrs. Gong asks for everything. Seon Yu spills the beans about the accident, Jin Yu, and the truth behind her relationship with Ji Seok, and why she had to get Tae Jeong kicked out. She even reveals that she tried to stop Ji Hui from marrying Tae Jeong, but she refused to listen. I know that as a real grandparent, Mrs. Gong would feel really sorry for Ji Hui, but at the same time, she should realize all that Ji Hui has done and concealed and she should also be angry at that. But maybe that’s just me. ‘m not saying she should hate her granddaughter or anything, but I’d be disappointed in her and her bad choices, especially when she knew the truth all along and couldn’t even bring herself to 100% trust Tae Jeong even after they married and she believed Seon Yu to be a complete liar. After hearing everyting, Mrs. Gong wants to keep protecting her grandson. Thus she doesn’t want Seon Yu to reveal the truth as Seon Yu is the only person Ji Seok trusts right now. In a sense of poetic justice, I suppose, she wants Seon Yu to spend the rest of her life living in misery concealing the truth from the person she loves most. Mrs. Gong leaves Seon Yu heartsick and sobbing and apologizes, but after all she’s done to Ji Seok, it’s up to Seon Yu to keep mo0re secrets and protect him like Mrs. Gong couldn’t. Again, bad decision all around. Ji Seok learns James was a fabrication and a con and he calls up our drinking Tae Jeong to meet for the truth. Tae Jeong who was vowing not to leave until he gets his slave wages quickly agrees to meet up with Ji Seok. He then calls up Seon Yu who was talking about giving up the foundation and Mrs. Gong who was adamant after their earlier conversation that this is a cross Seon Yu needs to bear, isn’t it? Seon Yu is horrified about the strike and the bigger rift growing in the Seo family and then Tae Jeong has to drop his bomb. Tae Jeong stands Ji Seok up to meet with Seon Yu. She knows Tae Jeong has no intention of telling Ji Seok the whole truth. Tae Jeong then asks for her help in letting him walk away with something. Seon Yu refuses and Tae Jeong says she just needs to stand still and do nothing so that he can meet with Ji Seok and get what he wants. He promises it won’t hurt anyone. Right. Like you can believe that. Ji Seok, of course witness the argument. Not the conversation, but he sees how heated and full of hate for each other the two are. Soon, Ji Seok-ssi, soon. We end with Evil Ji Hui rearing her pretty ugly head once more. She followed Seon Yu so she could get Tae Jeong to sign the divorce papers. He quickly signs and Ji Hui is once again disgusted with how quick he is to do so. Wasn’t he begging her yesterday? Tae Jeong says she is no longer useful, so why cling. Ji Hui asks if she was ever loved. Sure…as the daughter of L Foods. She smiles and thanks him for being honest so she won’t pity him. she then hands him a parental right waiver. Tae Jeong refuses to sign out of spite and when Ji Hui says she knew he’d do that and she throws him a bone, he signs for $50,000 probably like 5 million or 500,000 won. We end with Ji Hui about ready to burst a vein as she laughs and says he sold his son for such a measly amount. You know…it’s not legally binding until the stupid documents are filed, so she had better hope that Tae Jeong doesn’t renege in some way and get the documents and destroy them like before. I think I said my piece already about this episode and people’s actions. The sheise is about to really hit the fan. Ah, I will say that while Mrs. Gong really disappointed in her instructions to Seon Yu, she totally rocked when she confronted Dal Nyeo with the truth. I can’t believe that she honestly thought Mrs. Gong would forgive…or feel any sympathy…or what it just a desperate attempt to oust Seon Yu? For whatever reason she had, it was nice to see Mrs. Gong slap Dal Nyeo hard across the face with the truth. I also kind of like how while Mrs. Gong can’t necessarily forgive Seon Yu for her duplicity, she asks for the truth and she believes that Seon Yu is telling it now. She takes Seon Yu’s word that Seon Yu really was leaving for Ji Seok’s own good that last time and not as a ploy to draw him in more. This is proof once more that Seon Yu is far better than Tae Jeong…or Ji Hui for that matter even if she did wrong, her honesty and love for Ji Seok and at least uri samchon and Mrs. Gong is genuine. Yup! The dooky goes flying Sunday!! Slave wages? Since when did slaves get paid? Historically? Never. But we do have that saying of slave wages. Or rather we are a slave to a wage that just isn’t enough. I’ve heard the saying but I always laugh when I hear the saying. Ah…what is it called…an oxymoron? A slave is a slave so they shouldn’t be getting a wage just like it’s silly to call something that is still small a Jumbo Shrimp or call a small stream a raging brook. Oxymorons are fun just like onomatopoeias (SLAM, CRASH, CRACK, SLAP). You’re so smart!! A teachable moment!! Can’t wait until you recap for Sunday’s episode!! You & Nel have me all curious now. Evil people. Hopefully I won’t be too tired after my weekend with my sister’s family so I can watch it and get it up on Monday, but 2 year olds and 4 year olds require lots of attention and energy, lol. I so hoped JiSeok heard the important part of the Seonyu-TJ conversatioon where she said she didn’t want to hurt him. And…..what is the thing that Dal Nyeo doesn’t remember? I hope so too, but I think he was too far away to hear it. As for Dal Nyeo, I think she knows something about what Mrs. Gong may have done in the past, you know the whole evil plot revolving around Ji Seok and his birth mother. But she can’t place just where she’s seen Mrs. Gong before. I’m trying to imagine how all this will come out in a mere 12 episodes. How can we have peace and harmony after all these revelations? Grandma always seemed so good and noble but yeah, but now it looks as if she probably had her evil moments back in the day…stealing him from his mother etc. They’ve been throwing hints at us throughout the entire series, but like all “good” kdramas we must have our 11th hour throw everything in at the end of the series. I’m hoping for a good resolution, but it is kind of hard to imagine, isn’t it?